Oh the avocado. I love it so. Hopping off a flight to Australia and arriving at SFO with a layover, I do not always feel at my best. Add some avocado and my mood improves greatly! 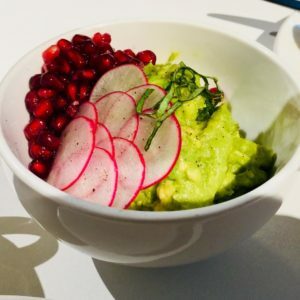 I eat Avocado almost every day, and here is a quick, simple and delicious way to serve it at home. Mash the avocado. Thinly slice some radishes. Scoop out pomegranate seeds. Finely chop cilantro. Voila – add your favorite toast and you have quite the gourmet, healthy and delicious breakfast, lunch or snack. The oasis in my travel desert is The Centurion Lounge at SFO where I experienced this scrumptious dish!